So far 2017 has been the year of statement stripes and polka dots for me. I can’t seem to get enough of either of these trends and patterns this year, and it all seems to be culminating as the end of summer nears. I bought this absolutely fabulous blue polka dot dress hoping I’d whisk it away with me to frolic around in on the streets of the Amalfi Coast. But, clearly that didn’t happen, and my chances of pulling that off before the lounge chairs and umbrellas are removed from the beaches are slim to none. I actually pre-ordered this dress MONTHS ago thinking I’d have to wait until September for it to arrive, but much to my happy surprise it arrived a few weeks early. The only problem was, as mentioned, I had nowhere terribly exciting to wear it. So instead of saving it for some fabulous engagement, I’ve been constantly wearing it around the streets of Los Angeles. I can’t believe how many compliments I get on this dress, each one only proves to me that the price I paid for it was worth every penny. I’m still waiting for the right place to take my new favorite dress out, really crossing my fingers for an impromptu trip to Mexico, but until then I’ll be wearing it plenty around town. It’s been a great maxi dress that can pretty much work for any occasion, whether it be casual or dressed up, the dress just says, “hey I look cute!”. 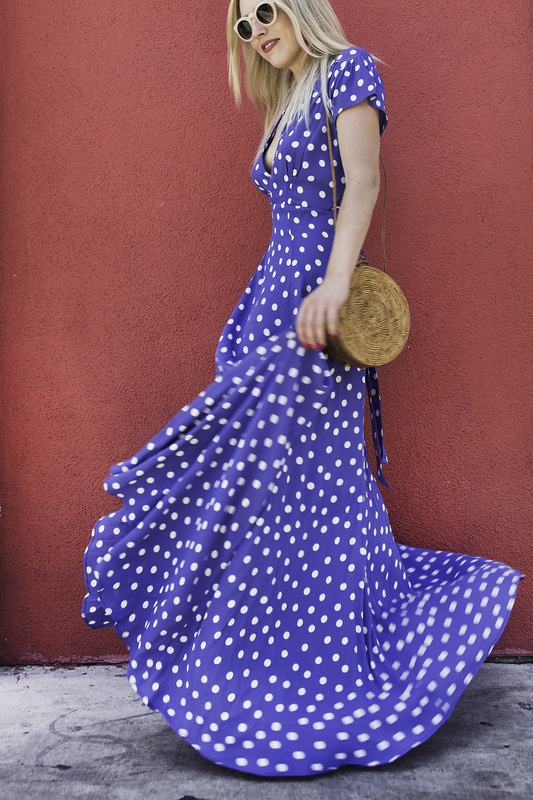 Besides the color and the polka dots, the thing I love most about this dress is that the bottom has tons of gathered fabric – when you walk there is so much fabulous movement it’s insane. If polka dots aren’t your thing right now, this dress comes in two other colors/patterns as well – at the very least, having a good maxi wrap dress in your closet will be a life saver. This weekend I’m heading to LA Food & Wine festivities!!! LA Food & Wine is easily one of my top 3 favorite foodie festivals in LA, if you haven’t been it’s definitely something to experience. There are actually still tickets to some of the events this year, if you’re going too please let me know! If you don’t find me at LAFW, you can find me in the gym – gotta do what I gotta do. what a truly stunning dress! The dress is absolutely stunning! I am thinking of buying it but don’t know if i should get it in Xs or S. What are your measurements?